Here is the latest session of our Sons of Lady Eighty Seven campaign. You can hear the previous session HERE. In this session the player's discover that their ally, Iron God Meng has been captured by the emperor and someone is trying to frame them. Sons of Lady Eighty Seven is a campaign I am playing as I build a sandbox for the Lady Eighty Seven Supplement (HERE is where the idea originated). Lady Eighty Seven and her Eighty Seven Killers Organization control several districts in Fan Xu province as a kind of shadow empire. Qin Daofeng: Brother of Wuji. Member of the Eighty Seven Killers and son of Qin the Apothecary and Saffron Tigress. Played by Steven. Qin Wuji: Younger brother of Daofeng. Reluctant member of Eighty Seven Killers who wants to protect Daofeng from harm. Son of Qin the Apothecary and Saffron Tigress. Played by Kenny. Boorish Drunken Sword: A drunken hero who married Guan Nuan, the granddaughter of Lady Eighty Seven. Played by Elliot. Lu Ping: A beggar of Nature Loving Monk Sect who recently became the disciple of a strange creature claiming to be Sun Mai. Played by Adam. 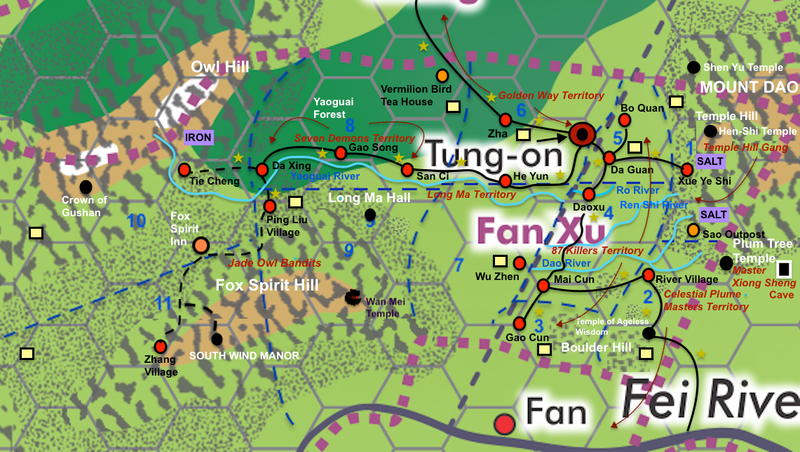 The campaign is set in Fan Xu Prefecture, which is in the southern area of the Zhan Dao Empire and comprised of 11 districts. Each district is patrolled by a military inspector and a sheriff (not all districts are the same in this respect, with most matching the arrangement described in the rulebook). This is my personal map of the area. It is just a mock-up. In the actual book we will have a map done by Rob Conley. Fan Xu started with my Blood in Daoxu adventure, which you can find HERE. Keep in mind I made several changes to Daoxu and the adventure material for the supplement.